NC State Online and Distance Education gives students an immersive experience in many online programs largely due to the innovative technology provided by Distance Education and Learning Technologies Applications (DELTA). Some of that technology includes virtual reality (VR). 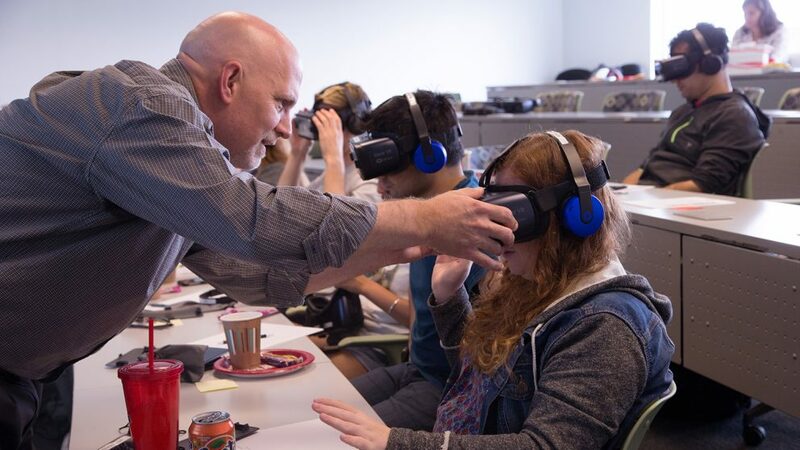 DELTA began exploring the use of VR for educational purposes in 2013, and during the last four years, they’ve worked with faculty and staff to create immersive learning experiences. NC State’s Global Training Initiative (GTI) uses VR for training programs to teach cultural competence. “Our mission is to connect campus resources with community needs for global success in North Carolina and abroad. The primary way we’ve done that in the past is to bring overseas groups to NC State for custom training programs and networking them [with] interested parties on campus and in the Research Triangle Park region,” says Ilin Misaras, GTI assistant director. Misaras says they now focus on working with students, businesses and organizations throughout North Carolina to help them become more globally successful through an immersive cross-cultural training experience. “By utilizing something innovative like VR to conduct training, we are demonstrating just how cutting edge we are at NC State,” Misaras says. She notes that other departments on campus are using VR in their classes, but GTI was among the first to use the technology in a narrative format. 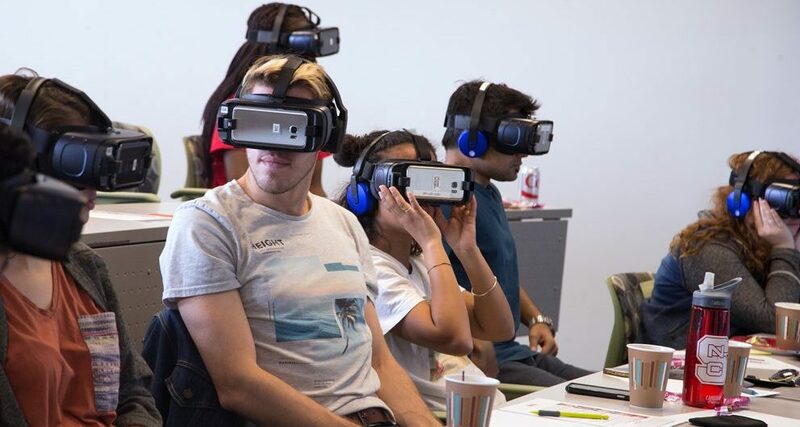 Ivonne Chirino-Klevans, Director of International Initiatives Teaching Assistant Professor, explains how NC State’s VR training allows students and professionals to immerse themselves into the perceptions of other cultures. 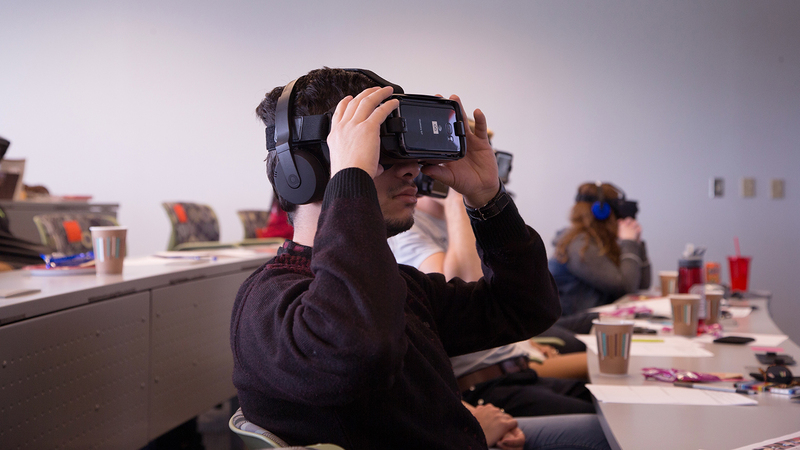 Mike Cuales, Creative Director of New Media Development, led DELTA’s work with GTI to create a VR experience that would give students and professionals a better understanding of cultural competence. The two agencies first became partners nearly seven years ago when GTI developed an online module targeted toward NC State’s international student community. This particular VR project was created through DELTA’s Exploratory Grants. “DELTA has played an instrumental role in helping us develop interesting ways to engage with students on various topics,” Misaras points out. Within this particular VR scenario, individuals first take the role of an observer in a global business meeting in Asia. “During that meeting there are several employees from different cultures whose task is to work together on a global project. The scene represents several interactions among the employees as they engage in different conversations that lead to conflict,” Chirino-Klevans explains. Misaras describes it as being “a fly-on-the-wall.” She says users can start to see and feel some of the tension based on interactions. The second part of the virtual experience allows the user to assume the role of one of the employees, becoming immersed in their thoughts. Students become immersed in the virtual experience. “These thoughts reveal cultural assumptions that represent different cultural dimensions that are involved in communication. The virtual reality scene is a component of a more comprehensive approach to developing cultural competence,” Chirino-Klevans adds. Misaras says this helps users view the conversation from different perspectives. DELTA was able to create this first-person perspective using a unique 360° camera rig to capture the scenes. “It’s one thing to teach our participants that people from other cultures may think and behave differently, but it’s another level when they are able to experience it for themselves,” Misaras adds. Overall, the exercise is aimed at developing awareness of difference and empathy through action learning, which Chirino-Klevans says are key components of cultural competence. GTI has conducted three workshops to test user experience with the virtual training. So far, Chirino-Klevans and Misaras say they have received positive feedback. Misaras says the most encouraging feedback they’ve received is that the users have really started to empathize with the characters in the training exercise.